They have a nervy start for the Final but Trump takes the opening frame. :-) Trump wins the second with 39, 2-0. Higgins pulls one back, 1-2 down. Trump stopped at 54 in the fourth frame, Higgins steals the frame to level 2-2 before mid session. Higgins wins the fifth time with 64,51 and leads in the first time, 3-2. 102 by Trump helps him to level the match 3-3. Trump tries maximum in the seventh frame, but he missed at 64. Higgins steals another frame from Trump to lead 4-3 again.... Trump wins the last frame of the session with a fluked red, all squared 4-4 after first session. 4-4 before it kicks off. Higgins takes the opening frame of the session with 60 before Trump levels 5-5. Higgins makes 45 but Trump wins the 11th frame with 30,32. In the last frame before mid session, Trump hits another century 102 to lead Higgins 7-5. 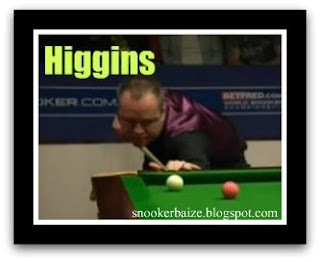 After mid session, Higgins pulls two back to level 7-7. There are no great breaks after 14th frame but Trump gets three in a row with 45, 48, 49. In Frame 16, Higgins is not in a good mood and conceded the frame with enough points on the table. Higgins is warned by Ref. Jan Verhaas and fined £250. 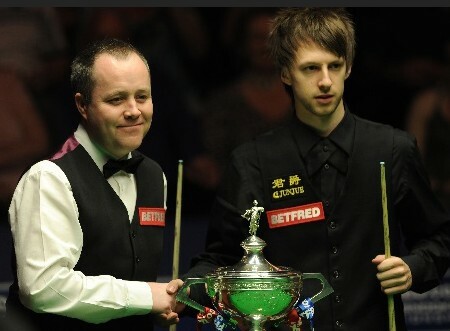 Tomorrow is our last day of the World Snooker Championship 2011. Who will become 2011 World Champion?